Searching for content by owner is the most popular way to search for content in Drive today. The new interface will use artificial intelligence to predict the people and files that you’re most likely to search for and make them more visible. We hope that this will help you find the files you’re looking for more quickly. The predictions will improve as the system learns how it’s used. We’re also working on more features which will use artificial intelligence and machine learning to make it easier to find files and collaborate more efficiently in Drive. Look out for more over the next few months. 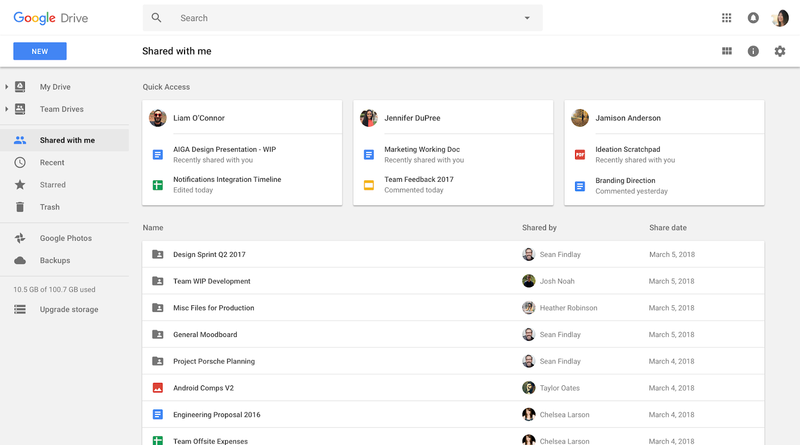 G Suite is built for working collaboratively—teams create and share files all the time. When there can be hundreds or thousands of files, though, it can be tricky to find those files later. So we’re improving how you find files that have been shared with you in Google Drive. The “Shared with Me” section shows the files that have been shared with you. We’re going to start intelligently organizing this section so you may also see people listed, along with files they’ve shared with you. Simply click on a document to quickly open it.